Evolution is a journey that endlessly creates itself. A continuous cultivation of new abilities, learning, trying, sharpening the senses. A grand adventure with symptoms of connectivity, love, sympathy and compassion that grant a moral compass and foster intersectional ideating. An experience enhanced by action – internal investigations, skillful listening of the spaces in between and exploration beyond borders. Through it all gives rise to a forum of solidarity and ideas worth spreading. Join us on Friday, January 6, 2017 at Vilar Performing Arts Center in the heart of Beaver Creek, Colorado for our next conference. Reserve your seat today at http://www.vilarpac.org/. Event is from 1-9pm. Doors open at 1pm. Tickets are $100 in advance and $125 at the door. The 7th annual TEDxVail conference features global leaders sharing unique ideas from all around the world with talks designed to spark deep discussion and connection in a small group. With ‘naturally’ as the theme for our conference, the program will unite some the of the world’s most fascinating leaders. TEDx Talks unmask passions and demonstrate mastery of natural progression to reveal ‘ideas worth spreading’ from an unbiased political or religious point of view. In the spirit of community, we reach out to all generations of the Vail Valley. 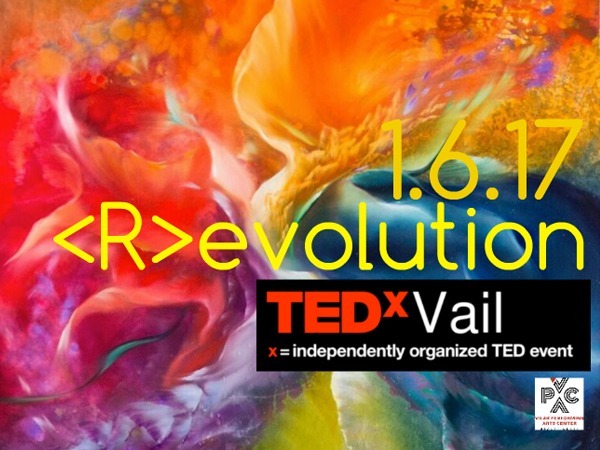 The next generation is encouraged to be a part of TEDxVail by offering scholarships to students and providing opportunities for our future leaders to help shape the event. TEDx events enable us to amplify intriguing ideas, inspire leadership in our community, empower youth and promote sustainability of our environment.